West Ham midfielder Mark Noble has spoken of his delight at signing a new Irons contract which keeps him at the club until 2020. After David gold tweeted the news earlier today Noble told www.whufc.com : ” “I’m obviously over the moon because it takes me until I’m 33! “I keep myself fit and this is great for me and my family, because it gives us security for the rest of our lives. Central defender James Tomkins also penned a new deal last week and so the Hammers are clearly building their team around their home-grown stars. 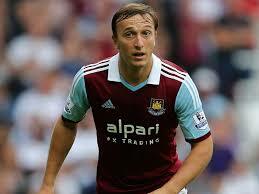 Noble is the club’s record Premier League appearance holder and has been with the club since he was 13. Not happy … he is well past his best …if ever there was one ! Too slow in brain and legs and lacking quality all round . He is not the foundation that we should be building on . £50k a week could have attracted a younger , fitter more talented midfielder . This move shows a total lack of ambition . Same old same old !! What nonsense! Noble is consistently playing better than Song without being as showy. To replace Noble would cost a lot more than a 5 year contract that’s for sure. 5 Managers have made him a regular and fans really need to understand how different skill sets make a decent team. Great news,love Nobes.He will always play his heart out for us.I have read people moaning he has lost pace,lost this,lost that recently.Its crap,earlier in the season people were calling for him to be in the England team.He then had a calf injury & has spent the last few months in midfield with Nolan.Every midfielder hasnt looked in top form since playing as a virtual 3 man midfield.I know some will disagree,the Nolan lovers,but it was no surprise Nobes was back to looking a proper player again at the weekend with Song,Kouyate & Downing with him.Its just a fact,no anti-Nolan sentiments needed for this statement.Spurs fans chant about the Gooner Kane being ‘one of our own’,well Noble really is one of our own & we should appreciate him for that.Well done Mark,you deserve this contract.